Yesterday I went to a workshop in Autodesk Barcelona premises to learn about Generative Design, a new functionality that Fusion 360 will include in few weeks. We first had an introduction about the new trends, the fact that Autodesk recognized few years ago that with CAD tools there will be no more growth, apart from regular economy cycles. A change of paradigm was needed. Generative Design, and everything that will come afterwards, is the first answer to this change. The EMEA Evangelist that presented the tool imagines a future where engineers, more than knowing how to create 3D models, will have to know how to code to get the full advantages the new tools will bring. Future tools will take care of the main part of design automatically. Generative Design will be a module in Fusion 360, only available to the Ultimate license. And it goes beyond topology optimizations. Starting with few pieces of information that you supply to the system -preserve regions, obstacles, fixed parts, loads and materials- the system calculates design variations that meet the defined objective: the most usual is mass reduction with a factor of security objective (in the examples it was 2). The nice part is that it makes designs that meet the requirements with not even needing an input model to start with. It is also possible to start with an object already designed and improve it through the same procedure. The outcome of a generative design can even be used as input for another study, and probably optimize it even more. 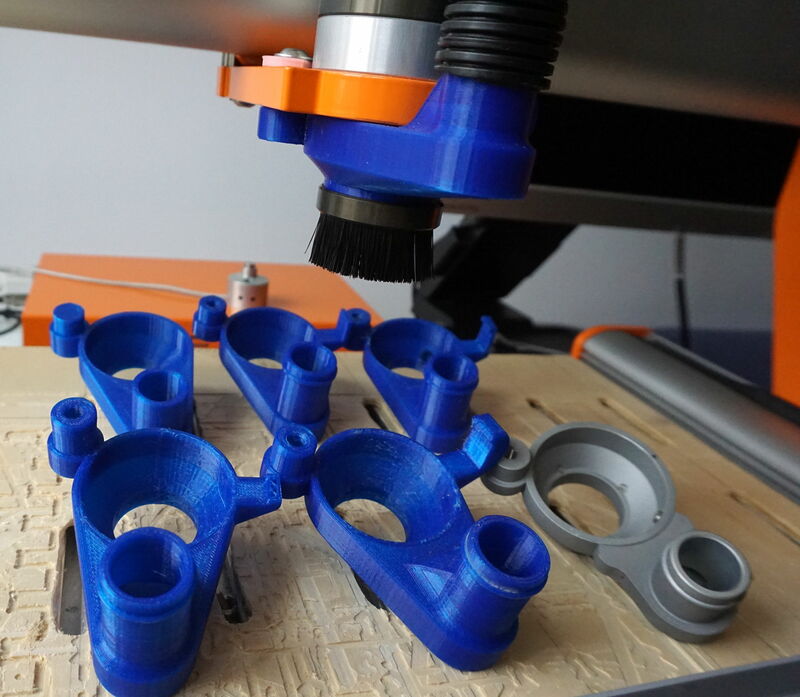 In addition you can choose which type of digital fabrication you are going to use, simulate the piece as it would be manufactured taking into account this particular technology restrictions, and of course you can get designs without restrictions. Currently only 3D printing (additive manufacturing) is available as technology but there are others in the roadmap. Additive manufacturing option also has to improve because it makes permutations of the object by printing in different axis without supports (for now just +X, +Y, +Z and the opposite direction is missing). You can see the typical staircase with layers when there are overhangs. It also takes into account the material used. You can add anything you want (titanium, aluminum, stainless steel, nylon, etc…) but in fact all of them are currently calculated as if they were metals, taking into account its linearity behavior when load is increasing. He explained to us, for example, that plastics deformation is non linear and difficult to calculate: it bends a bit and collapses suddenly. The titanium models are amazing!! like the GE bracket case. A bracket used to anchor plane turbines for maintenance. In this link “GE Bracket Quick Start Tutorial” there is a full tutorial on how to make it with Generative Design. This was the first exercise we did, each one with a laptop provided by Autodesk. After generation is launched you can see all results. Some of them are not valid since they do not meet the requirements (for instance factor of security < 2) but they can sometimes be interesting. I insist in this, you have not provided any kind of form, just where it’s forbidden to have material and where it is mandatory. From all these options you take the one you like more and after giving away some credits, you can download it in SAT or STL formats. SAT is better because you can modify properly in CAD software. Here is for example the same bracket exported in SAT format and imported in Fusion 360. After this case we did another exercise, less guided, with a shelf support. The tool is pretty easy to use, since it has few options by now. Let’s see how it works when its integrated in Fusion 360. With a bit of practice you can create models with good aesthetics that meet the weight requirement and others. Obviously this is not for everyone, since it’s focused right now in metal 3D printing, and only available in the Ultimate paid license. In addition to the annual license, there is a pay-per-use with a cost in credits. In fact it could be used for many designs, even gadgets or home spare parts if you print in metal or use plastic filaments but with a factor of security substantially higher. PS: sorry for the pictures but I had to take them from the laptop lent to me, I had no way to get a higher quality capture. I will be teaching a couple of courses more of Fusion 360 in Barcelona after vacations, same format as the one I gave (12h in several sessions, you have the full program here). There is no announcement yet but if you are interested just ask me. If you liked Generative Design and want to know more or watch it in action, check this video from Lars Christensen, evangelist at Autodesk.